A visit of Rome in 4 days will surely give you the opportunity to enjoy without hurry most of the attractions in the capital. Museums, parks, monuments will no longer have secrets for you. There are a thousand itineraries that can be organized to visit Rome in 4 days, and you can choose them according to what you are interested to see and the time you want to dedicate to each attraction. To make your task easier, we offer you our suggestions, including all the attractions that you should not absolutely miss during your stay in the Eternal City. This is a rough itinerary, which you can follow in full or even partially, depending on what you want to do. Since you are still full of energy, we recommend that you start your itinerary to visit Rome in 4 days from the Vatican City (metro stop: Ottaviano-San Pietro).You should arrive early in the morning, when the flow of visitors is still low. 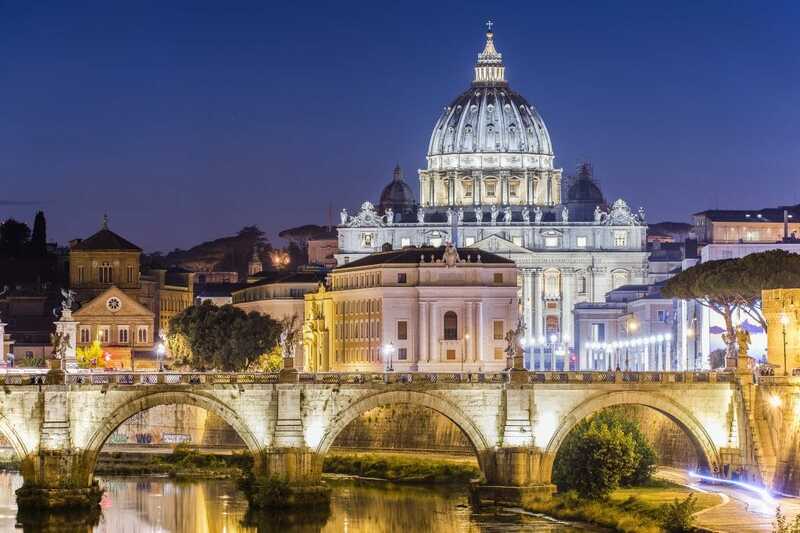 Visit immediately the Basilica of San Pietro, the largest, rich and spectacular Italian church. No photograph or explanation by people who have visited it can make to feel the emotion that the grandeur of the building inspires with the magnificence of the decorations and the works of art that it contains. We recommend that you wear appropriate clothes if you do not want to be stopped from accessing the basilica. Miniskirts, shorts, or bare shoulders are not allowed. At the end of the visit, stop for a few moments in Piazza San Pietro, enjoying the magnificence of what is one of the largest public spaces in the world. Then head to the Vatican Museums, which are nearby. We advise you to buy the tickets online to avoid the queue at the entrance. The museum (equipped for the disabled) is immense and it would take years to see it all, therefore, for a panoramic visit we suggest you go to the Pinacoteca, the Pio-Clementino museum, the geographic maps gallery, Raphael rooms and of course the ‘unmissable Sistine Chapel with the priceless frescoes by Michelangelo. Consider being in the museum for at least two hours. 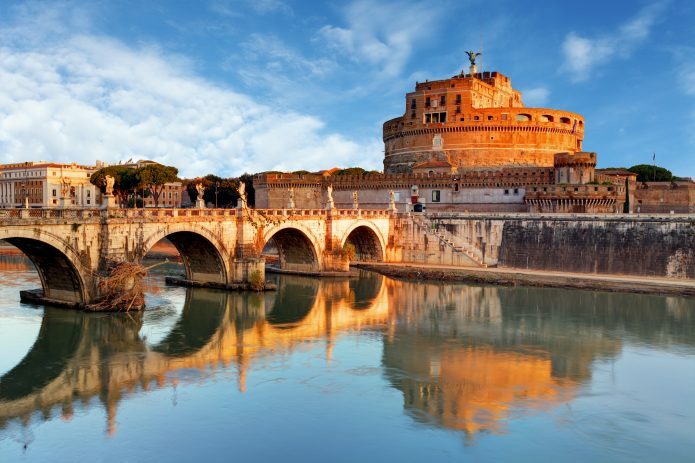 After leaving the museum, walk along Via della Conciliazione toy arrive at Castel Sant’Angelo, the papal fortress built in the Middle Ages on the ruins of the emperor Hadrian’s mausoleum. (II century d.c.). Do not leave the fortress without a stop on the Terrazza dell’Angelo, where you can enjoy a spectacular view of the city. If you have the Roma Pass you can skip the queue by passing through the appropriate turnstiles for direct access to the site.After the visit, treat yourself to a well-deserved break to eat and regain your strength. Pay attention because that the area around the Vatican is full of pizzerias and trattorias that often serve poor food at an excessive price. Continue your itinerary by crossing Ponte Sant’Angelo, and take a stroll through alleys and squares that still maintain an authentic Roman character. Head towards Piazza Navona, the quintessence of Roman squares. Let yourself be enchanted by the marvelous Baroque palaces and exuberant fountains (including that of the four Bernini rivers). The square is characterized by a large crowd of tourists, portraitists and street artists who fills it every hour of the day and night. If you want to take a break you can go to the nearby Piazza Sant’Eustachio and enter the Café with the same name: the place is not anything special but serves the best espresso coffee in the city. Then go back to Piazza Navona and exit the square towards the south. Cross Corso Vittorio Emanuele and follow Via dei Ballauri to Campo dei Fiori with the famous statue of Giordano Bruno, a heretic monk condemned to the stake during the Counter-Reformation. The square is one of the focal points of Roman life: during the day with a busy market, in the evening is a pace where to go for a drink. Finish your evening by dining around this area. 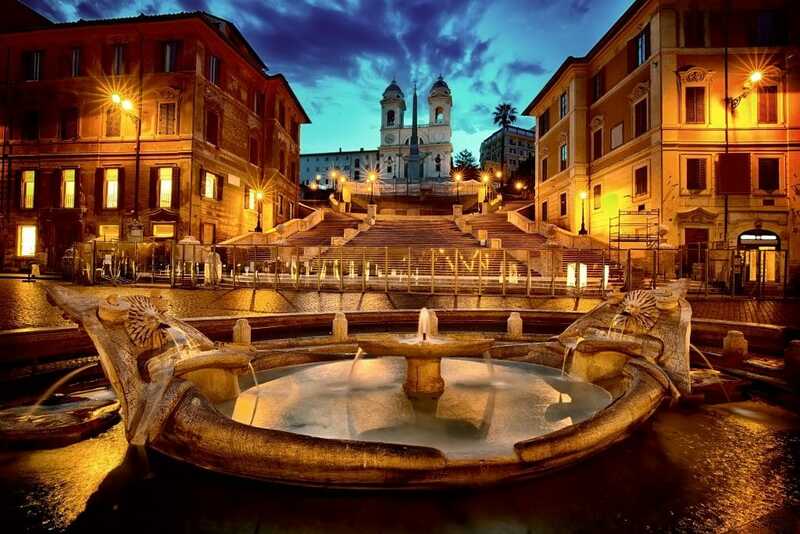 The second day of your itinerary to visit Rome in 4 days starts from Piazza di Spagna (metro stop: Spagna) with its famous steps of Trinità dei Monti (which after the restoration has regained all its splendor), at whose feet you will find the famous fountain of Barcaccia. Together with the ocher-colored buildings that surround it, these architectural elements give the square an indisputable eighteenth-century elegance. In front of the stairway there is Via dei Condotti, destination of the expensive shopping fans. Along the way there are indeed the most elegant shops in Rome. If your wallet allows you, do not miss the opportunity to make purchases. Follow the road all the way up to Via del Corso (another shopping street) from where you can reach the spectacular Trevi Fountain, the largest and most famous of Roman fountains. You will notice the fountain suddenly, with an emotional impact that will leave you breathless. The streets leading to the fountain are not in fact aligned with it. One can understand Its proximity by the noise of the water, but nothing allows the visitor to foresee the magnificence of the place. After stopping at the Trevi fountain, taking your inevitable photos and eating something, cross Via del Corso and go to the Pantheon. Together with the Colosseum, the Pantheon is one of the great symbols of Rome and the best preserved ancient monument of the capital. The visit of the building will leave you amazed, with its largest concrete dome in the world and the interior covered with marble. 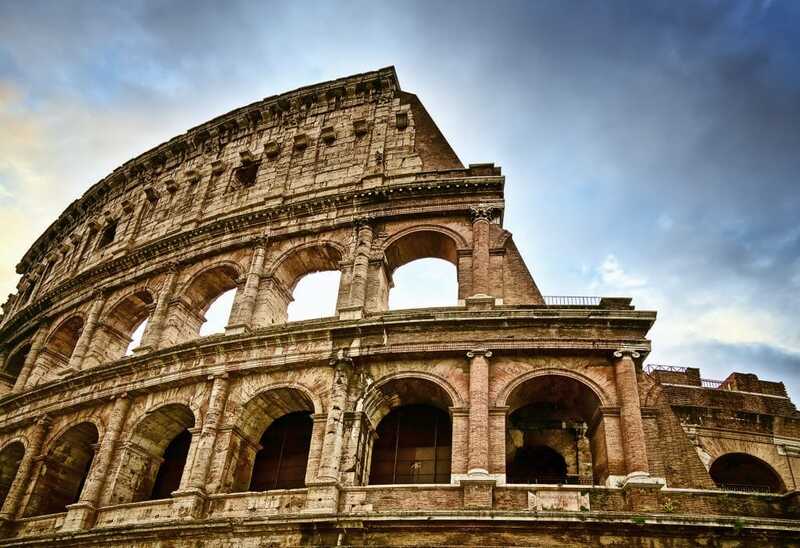 The third day of our itinerary to visit Rome in 4 days includes going to the discovery of ancient Rome. We recommend starting the tour in the early morning to avoid the hours of overcrowding and to take bottles of water and something to eat. You will avoid spending a fortune to buy them in bars or vans in Via dei Fori imperial. Leave from the Colosseum (metro stop: Colosseum), the symbol of Rome par excellence and the most exciting among the monuments of the ancient city. If you decide to visit it inside, buy the ticket online (Roma Pass), you will skip the long lines at the entrance. Not far from the Colosseum you will find the Arch of Constantino, the most famous of the Roman triumphal arches and one of the last monuments of ancient Rome. After taking some souvenir photos, take Via dei Fori Imperiali and arrive to the Roman Forum, once a pulsating heart of Rome, which will be on your left. On the other side of the road there is the whole area of the Fori Imperiali, the archaeological complex that contains all the forums built by the various emperors between 42 AC and 112 AD. You can admire the Forums from Via Alessandrina, by arriving up to the imposing Trajan’s Column. Along this route there are not many restaurants or bars, so we suggest that you eat something packed once you arrive under the Trajan’s Column. Alternatively, if your legs allow it, you can reach the Rione Monti (from the Imperial Fori take Via Cavour and then turn into Via dei Serpenti). It is a district full of hills, but full also of trattorias, trendy clubs and bistros. Once you have refreshed and rested a bit, head for Piazza Venezia to visit the Vittoriano. The judgment on this attraction divides visitors into two groups: those who love it and that of those who hate it. What is certain is that it is impossible to ignore it. Built in 1885 to commemorate the unity of Italy, today it is dedicated to the unknown soldier. Please note that it is forbidden to sit for respect of the place and the controls are strict. The view that can be enjoyed from the terrace at the top is incomparable. You can reach the top of the Vittoriano with the panoramic glass elevator accessible on the side of the building. As the last stop of the day, we suggest you to visit the Campidoglio, the most famous and smallest Roman hill. The most spectacular way to get there is along the Cordonata the steps leading from Piazza d’Aracoeli to Piazza del Campidoglio, designed by Michelangelo. Here there is a perfect copy of the equestrian monument to Marcus Aurelius. The original is located in the Capitoline Museums (equipped for the disabled) located on the right of the square. The Capitoline Museums are the oldest public museum in the world and are absolutely worth a visit. Dedicate the last day of your itinerary to visit Rome in 4 days to discover one of the most beautiful parks in the city: Villa Borghese. It consists of several parts, and you can find avenues lined with trees or hedges and flower beds. It is crossed by pebble bodies as well as by some roads. The park is ideal for resting or for taking the children for a picnic. The main entrance is on Piazzale Flaminio, that you can easily reach by getting off at the Flaminio underground station (line A). From there take Via Flaminia and follow it until you reach Via di Villa Giulia. Continue on this road that will take you to the National Etruscan Museum of Villa Giulia, which since 1889 houses the national collection of Etruscan objects coming mostly from graves scattered throughout Lazio. Among the most important pieces we point out the sarcophagus of the spouses, finely sculpted. Then enter Viale delle Belle Arti. Stroll up to the staircase of the National Gallery of Modern Art where you can find masterpieces of Italian artists between the nineteenth and twentieth centuries. Return to Viale delle Belle Arti and continue until you reach Viale di Villa Giulia. 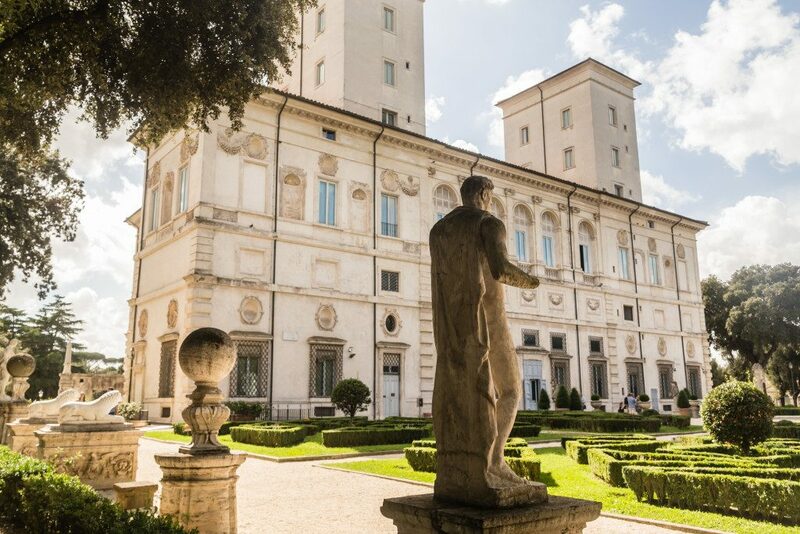 Enter the park, walk until you get to the Museum and Galleria Borghese (included in the Roma Pass) which houses one of the most prestigious collections of art objects in Rome. In one space you will find concentrated works by Caravaggio, Bernini, Botticelli and Raphael, and the famous statue of Canova portraying Paolina Borghese as the winning Venus. Once out, take Viale Museo Borghese and reach Corso d’Italia. Go through the Arco di Porta Pinciana and arrive in Via Veneto. Walk on this historic street of Rome, with its cafés, clubs and luxurious hotels, also immortalized in the unforgettable film “La dolce vita” and arrive to Piazza Barberini, where you will find the beautiful Bernini’s Triton Fountain. It represents a triton blowing a jet of water through a shell, sitting in turn on a shell supported by four dolphins. Our itinerary to visit Rome in 4 days ends here. In this itinerary we have included several museums in the Villa Borghese. You can decide whether to visit one, or more than one and, consequently, when to have a lunch break. San Pietro Basilica: 1st October – 31st March every day 7am -6.30pm / 1 April – 30 September every day 7am-7pm. Free admission. Vatican Museums: from Monday to Saturday 9am-6pm (last admission at 4pm and exit from the rooms half an hour before closing). Colosseum: every day except 25 December and 1 January 9-17. Until February 15th 8.30am – 4.30pm; 16 February to 15 March 8.30am – 5pm; from the 16th to the last Saturday of March 8.30am – 5.30pm; from the last Sunday of March until 31 August 8.30 – 19.15; from 1 to 30 September 08.30am – 7pm; from 1 to the last Saturday of October 8.30am – 6.30pm. Last admission one hour before closing. Full ticket € 12, reduced ticket € 7.50, free under 18 years. Included in the Roma Pass. Capitoline Museums: every day 9.30-19.30, 24 and 31 December 9.30am – 2pm. The ticket office closes an hour earlier. Closed on January 1st, May 1st, December 31st. Full ticket € 14, reduced ticket € 12. Included in the Roma Pass. Villa Giulia’s National Etruscan Museum: Tuesday to Sunday 8.30am – 7.30pm; the ticket office closes at 6.30pm; closed on Mondays; also closed on January 1, May 1 (except for special openings arranged by MiBACT) and December 25. When the Monday, closing day, coincides with a holiday (eg Easter Monday), the museum remains open. Full ticket € 8.00, reduced ticket € 4.00. Included in the Roma Pass. National Gallery of Modern Art: Tuesday to Sunday from 10 am to 6:30 pm 24 and 31 December from 10 am to 2 pm. Closed on Monday, 1 January, 1 May, 25 December. Admission is allowed up to half an hour before closing time. Full price: € 7.50, reduced ticket: € 6.50. Included in the Roma Pass. Borghese Museum and Gallery: closed on Mondays, from Tuesday to Sunday from 8.30am to 7.30pm. Closed 1 January, 25 December. Admission is allowed until half an hour before closing. Full € 11.00 (9.00 + 2.00 booking required), reduced € 6.50 (4.50 + 2.00 booking required). The cost of admission to the museum may be increased compared to the amount paid at the time of booking for the opening of a temporary exhibition. Included in the Roma Pass.